The current group of Calendar Girls & Company standing left to right: Jean Harnett, Barbara Hartl-Renna, Angela Marrocco, Nikki Ferraioli, Maryanne Zuhowski, Madeline Hawryluk, Dee Matthews, Betty Jean Monahan. Sitting left to right:Patricia Scairpon, Violet Sestilio. The Calendar Girls & Co. have been a staple in Ocean County for more than 30 years. We are a Senior Performance Show and it was all started by Helen Sweeny in 1984 at Our Lady of Perpetual Help Church, Seaside Heights. Over the years many different ladies practiced and performed with us and some have left us and others have joined. Our dancers are in their 60’s, 70’s and 80’s and we are always looking for new members who can tap dance and give of their time to bring happiness to others and bring excitement in their own life. We also hope to inspire other women to do the same no matter what age. We are very fortunate to have two former Rockette’s in our Company along with some members that have had their own dance studios or were dance instructors. Our Senior Performance Show is one hour long with five dances and fivecostume changes in each show. We have over 30 dance routines which includes a diverse selection of music such as Broadway show tunes, holiday songs, Rock and Roll and more. We are learning new routines all the time. This makes each show different even when we do repeat performances. We also have in the show an emcee/comedian, Ted Ferraioli and two vocalists, Pat Rongo and Agnes Traschetti who perform while we are changing costumes for our next number. We rehearse twice a week for two hours each at Toms River Senior Center and Silver Ridge Park East Clubhouse. The ladies come from different towns and walks of life but all have had some tap and jazz dance experience. We travel to three different counties to perform our shows. 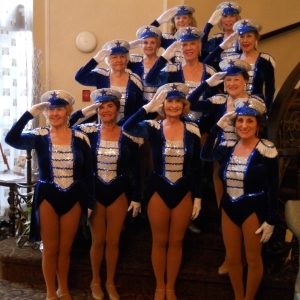 We enjoy performing much to the delight of our audience whether it is in an assisted living facility, nursing home, clubhouse, library, association, or volunteer organization. We have also performed in Atlantic City at Resorts, Taj, and Convention Hall. It is our mission to bring joy to others as much as it does to us doing the dancing. I am the co-manager along with Violet Sestilio and we were appointed managers 18 years ago by Rita Kennedy who was the manager at that time. We are still doing our job even with many changes and loving it more each year. Editor’s Note: For booking information for The Original Calendar Girls & Company, contact Jean at 732-730-3539. I’ve seen this talented group perform at The Doolan’s Shore Club in Spring Lake, NJ. around the Christmas holidays. The room was packed. The food was 5 star. The entertainment was the icing on the cake. Lots of fun that day! This group in quite an inspiration. Keep it up! Wonderful to see great young ladies beautiful too Keep up the good work! Kudos to the ladies and their shows. Great job Patti! Great job Patti and company! Wish I could see you perform in person, but unfortunarley that’s highly unlikely due to time and distance. Keep on “steppin’ out”. I’ve known Patti since high school – she never changes (well – maybe just a little). Patti was a very close friend in high school, I would watch her do her Ballet practice on Saturdays, God bless her to be able to keep up with Dance. Very proud to be her friend friend. Would love to see you girls do some travelling and come to Florida and entertain us seniors in our native land. I know there are many opportunities here. Performing is a talent given to everyone, even the seniors, and this proves it. Come on down ! ! ! ! ! Congrats to the company of Calendar Girls, and Congrats to you Patti…. I am proud to be a Calendar Girl. We are very close and I have found 9 sisters . We bring great joy to all and at the same time we are exercising and enjoying our senior years. And yes we are living out our fantasies of being on Broadway or in the movies as so many other people would love to do. As a former Calendar Girl, I am proud to have been in this troupe of women dancers. The music is familiar to all, and the costumes are spectacular! These ladies practice twice a week, all year long, working hard to make their performances the best that they can be. There are varied routines, sure to please any group or organization. The Calendar Girls are seniors entertaining seniors, and the audiences sure do show their appreciation!